It's easy to get wrapped up searching for the perfect design. Thoughts like, "What should I make?" Which design stamp should I use?" "Which fancy blank do I choose?" "What word?..I need a cool word to stamp!!! Hand me the Thesaurus!!" Just like a scoop of sorbet before the main course, a simple palate-cleanser just might be the thing. This idea is sure to be popular with your friends or customers. 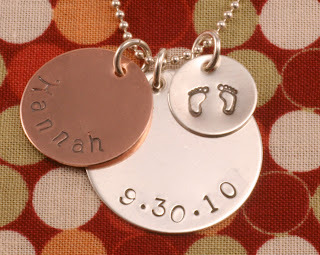 Simple, quick and personalized. All three blanks can be hung together on the same jump ring or can dangle individually side-by-side. 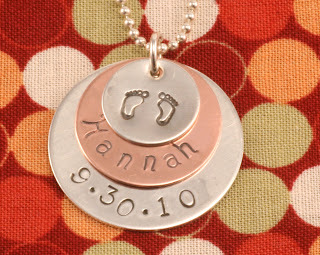 This design celebrates a baby birth, but you can personalize it to suit your occasion. Here is how to do it. These three sizes stack together perfectly. Stamp each blank with the name, date and design of your choice. Oxidize and polish the blanks, add a jump ring and hang on a chain.